For North Korean refugees who made the perilous journey to South Korea to escape the repressive regime, learning English is not only about surviving in the hyper-competitive South Korean society. It is also about pursuing their new freedom, finding their identities and regaining their voice, said Casey Lartigue, co-founder of Teach North Korean Refugees, a Seoul-based nonprofit group. Whether they are looking to apply to university, get ahead at work, travel abroad, or teach their children English themselves, the North Korean refugees are given chances to design their own curriculum. That way, the refugees realize they have control over their own lives, not only in studying English, he said. In South Korea where English test scores are required at schools and workplaces, learning English is essential to complete their education, land a job and climb up the social ladder, just like their South Korean peers. To help defectors integrate into South Korean society through free English lessons, Lartigue, a Harvard graduate and a former policy analyst, and Lee Eun-koo, a South Korean national who worked for the government, founded TNKR in Seoul in 2013. “My life changed on March 1, 2012. Up to that point, there were about 30 North Korean refugees who had been caught in China and were about to be sent back to North Korea. And I was like, ‘This is crazy,’” Lartigue said. He then joined protests in front of the Chinese Embassy in Seoul, which was the beginning of his fight for North Korean refugees here. 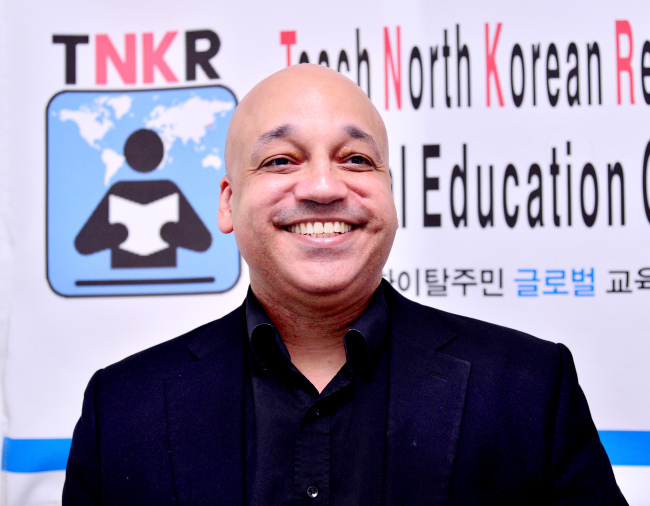 TNKR matches North Korean refugees with volunteer native English speakers for free, one-on-one language classes and public speaking coaching sessions. The students can pick their own tutors and the topics that they want to study in a self-directed environment. “It is all about them having the power to choose for themselves,” he said. Over the years, some 800 volunteers have helped about 400 North Korean refugees improve their English skills through the programs at TNKR. At the moment, some 60 refugees are engaged with some 90 volunteers. The North Korean refugees seeking help from TNKR are mostly in their 20s and 30s. According to the Ministry of Unification, there are about 31,000 North Korean defectors in South Korea as of this year. A 2015 survey by Korea Hana Foundation of 912 North Korean defectors attending colleges or universities here showed that 185 of them had taken a leave of absence and 150 had dropped out of schools. The most often cited reasons were to earn a living (30.3 percent) and to study English (28.6 percent). Equipped with English skills and confidence, some of the refugees went on to talk about their experiences and the human rights situation in North Korea by publishing books and appearing in media.